There are many ways for me to count my blessings for this year in Africa but surely one of the most obvious is in the wondrous nature I have on my doorstep. Almost every weekend (if I can muster the faith in my Lada to make another road trip) I can immerse myself in stunning natural habitats and gaze upon some of the most beautiful and endangered animals on the planet. This great fortune was brought home to me by two events last week. Firstly, I attended the local première of the film Earth. Those of you who have seen the BBC/Discovery Channel series ‘Planet Earth’ will be familiar with the footage but I would urge you to go and watch it on the big screen, it is still a truly magical experience. I am an avid watcher of natural history shows back home and I normally sit in front of such programmes with a child-like awe for our little green planet. Yet this night I left the showing feeling strangely unmoved. 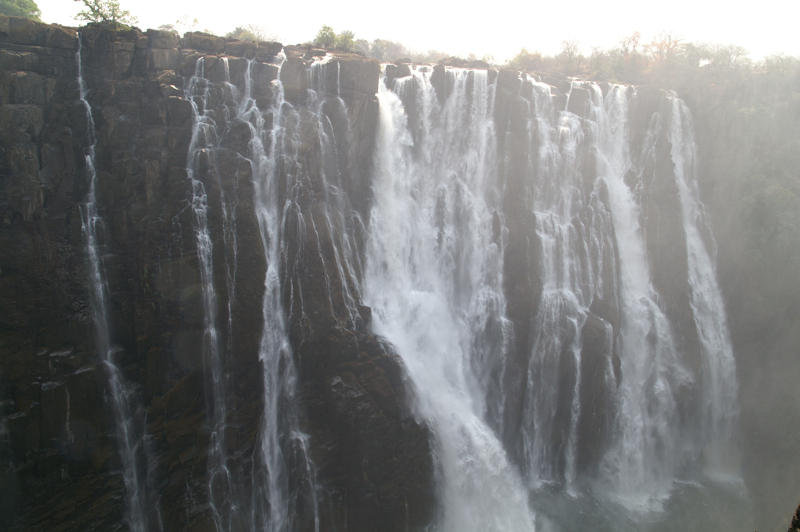 Somehow, as beautifully shot as it is, the sequences of Victoria Falls that both open and close the film just aren’t a patch on the real thing. Sure the film can let you see, but it just can’t make you feel the raw power or immense scale of this natural wonder. Secondly, at the weekend I ventured six hours north to Kasanka Trust, a small wildlife reserve close to the DR Congo that also featured on the BBC series ‘Life’ not too long ago. Although a beautiful piece of pristine wilderness all year round, what really makes this park’s name is the visitors it greets each year around this time. 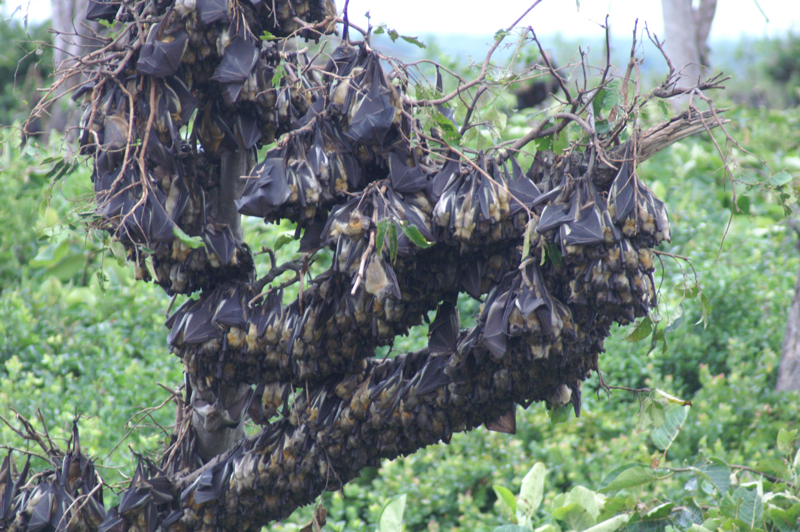 From the first week in November until the mid of December, up to 12 million fruit bats from all over Africa converge on one tiny piece of woodland. Scrap any thoughts you might have of small furry winged rodents, these guys are big and beautiful with a wing span of 80cm and strength enough to fly back and forth across the continent for each of their 18 years of life. Nobody is sure why so many colonies all converge on this piece of woodland. Their numbers are so great that they actually destroy the trees they perch upon. Aerial photo’s of the area from the 1960’s show no such destruction so it may be a loss of habitat in other areas that has concentrated so many of them to this one remaining patch with its unique combination of marsh and forest canopy. 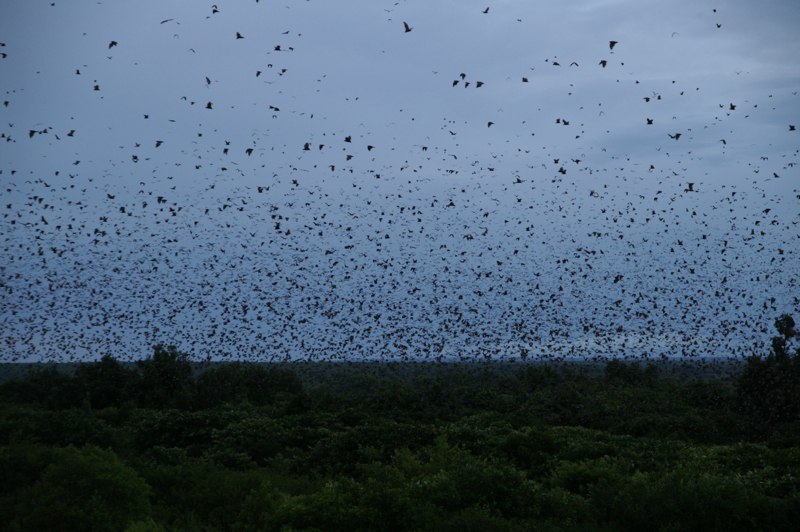 As you make your way down to their protected roosting area in the evening twilight it is hard to tell the bats from the trees. The only thing that gives their presence away is the low chattering and an odd burst of flight as one looses its footing or seeks a better perch. Then, just as the sun sets, the chattering grows to a crescendo and suddenly, via some unheard signal, the sky darkens as the horizon fills with 12 million bodies taking to the air. I’m afraid my words struggle to do this event justice and my pictures certainly don’t but you will have to take it from me when I say that it is sight to take your breath away. 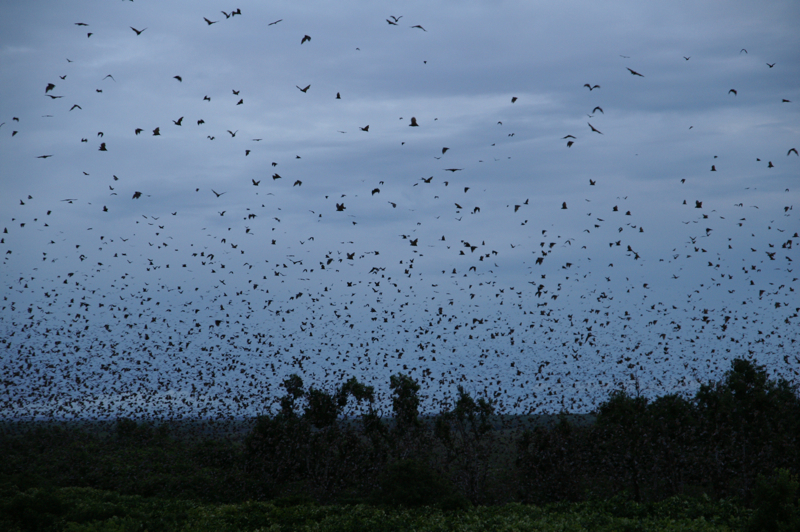 You pick up your binoculars, turn them to any point in the sky and all you can see are thousands and thousands of bats, each picking their way by sight (fruit bats are not equipped with sonar) towards their feeding ground for that evening, some travelling up to 80km each night. By 5am they are all back and ready to roost for another day, hoping that their perch doesn’t give way during the day and leave them vulnerable to the large crocodiles that stalk the marshes below or the looming African Vultures that watch them hungrily from on high. 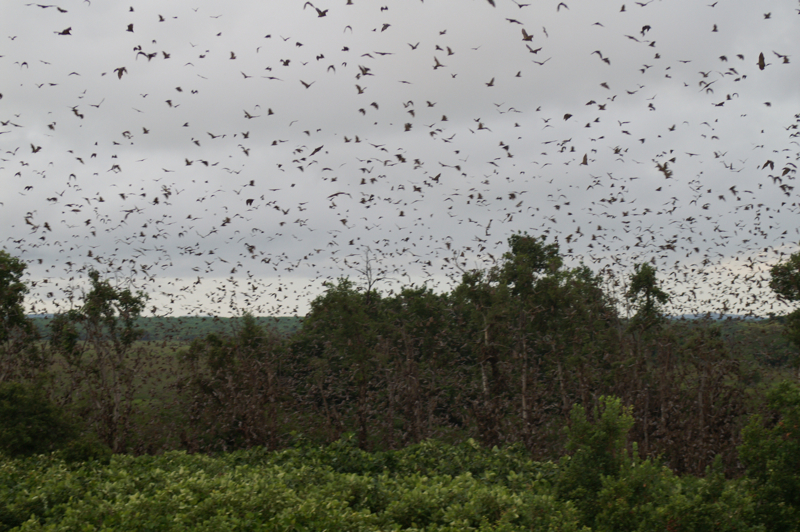 Like seemingly every species today, the bats are endangered by a loss of territory due to human encroachment. 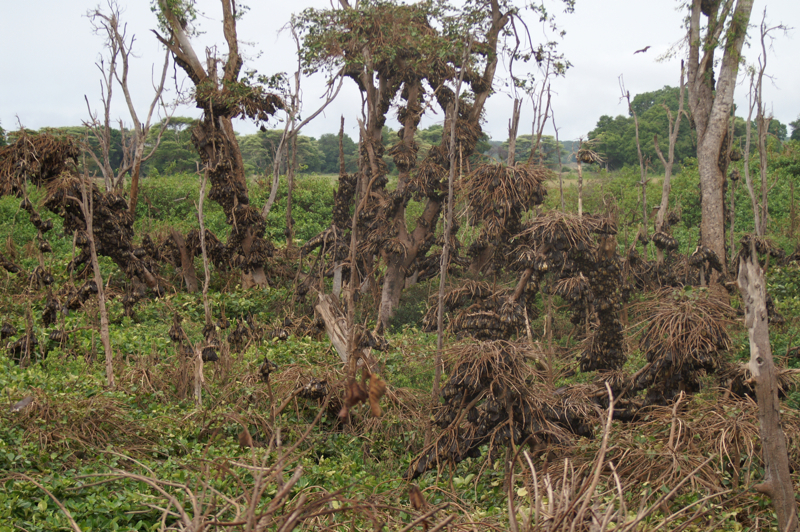 Although this part of the world is startlingly underdeveloped, the woods are still cut for charcoal and the habitat is slowly being turned for agriculture. 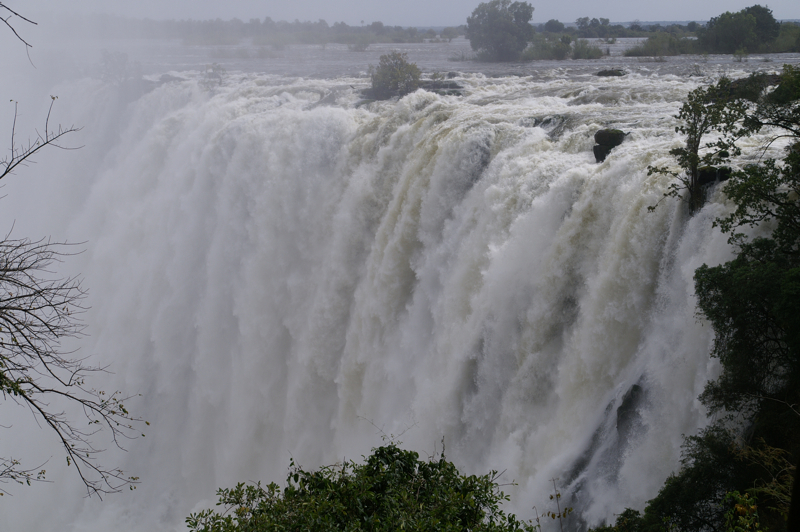 What is good for Zambia’s economy is already becoming a problem for Mother Nature. All I can say is that I know how spectacularly fortunate I am to see so many of these natural wonders, up close and in the flesh. There is a trip to the magical sand dunes and skeleton coast of Namibia yet to come over Christmas. Watch this space for more photo’s and yet more gushing. My child like awe remains in full effect!